It is scarcely believable but the Audi R8 will be celebrating its 8th birthday this year. What is admirable is that Audi's first attempt at a supercar has only received minor cosmetic and mechanical tweaks to remain competitive in a market place of Porsches, Ferrari' and Lamborghinis. It knows its place in the VW group line hierarchy as the more sensible supercar to sister company Lamborghini's wild Gallardo and LP 560-4 variants and whilst perhaps not as jaw dropping as the italian it has won many hearts and orders purely by being an Audi. That may be a strange statement but I believe to be entirely true in that it is a supercar made by the company that makes the very car that you can afford and drive on a daily basis, and that is part of the key to the passion of the R8. It is a supercar that anyone can relate to. This of course does have an adverse affect on some petrolhead's opinions as that is entirely what it is, an Audi, but a really fast one with the engine in the right place and rear-biased permanent four wheel drive system. In addition it is seen by some as perhaps too polished and easy to live with. There's a notion that supercars should be cramped and uncomfortable, roughly finished and edgy at the limit! Whatever your thoughts on the R8 let's face facts - it is a sensible, restrained supercar - maybe one for the conservative type - but a supercar nevertheless. The genesis was the V8 coupe which is what we have on test. Little has changed since 2007 - the Walter de Silva design still looks sharply Germanic and turns heads like the front row of cinema goers. The engine is still the same acclaimed RS4 derived motor only with a dry sump to enable it to be mounted lower to the ground with a remote reservoir housing the oil to supply a constant flow during aggressive cornering. It has received only a minor tweak over the years, to produce an additional 10bhp. The 4.2 litre aluminium V8 is fitted with direct fuel injection and variable valve timing and really likes to rev with peak power of 424bhp being delivered at 7,900rpm and stopping at a glorious 8,500rpm redline. Being naturally aspirated torque lags behind the competition at 317lb/ft, which is available between 4,500 and 6,000rpm but it doesn't feel like it's lacking twisting power due to its light weight. 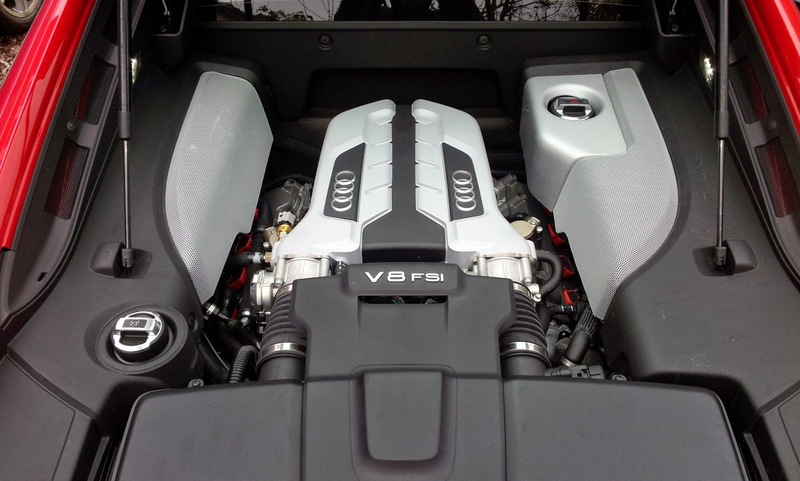 The main benefit of the smallest engine in the R8 range is that it is lighter than the V10 by some 60kg which in turn means it is that little bit more agile in the corners and take some of the pressure off the brakes. In addition as the engine is shorter there is more available cabin space behind the seats so they can recline further or even fit some specially tailored luggage for a weekend away. The manual gearbox is still offered but in the test car sat a 7 speed S-Tronic twin clutch auto which sends 70% of the power to the rear wheels and 30% to the front wheels which explains the safe but playful nature of the R8. This car features fixed rate suspension so no fancy magnetic wizardry, just double wishbones at each corner. One upgrade the R8 has received over the years is the fitment of steel wavy discs which are lighter than conventional round edged ones. The weight difference is minimal but any effort to reduce unsprung weight is welcomed so the suspension components can react quicker to changes in the road surface. The wavy discs are clamped by some pretty serious looking 8 piston calipers up front with 4 piston calipers at the rear and finished in black with R8 logos behind the polished 'Y' design alloys. The alloys add some bling to the restrained contours of the R8 and, although an option at £870, are the icing on the cake. The bodywork has stood the test of time - it hasn't been changed at all since launch, although the grilles have been refreshed. Down the side of the car the most striking feature is the controversial sideblades, seen here in carbon fibre as an £1800 option. At launch the sideblades seemed over the top and, to my eye, ruined the R8's lines but over the years have grown to be part of its identity and I do hope they appear on the future model. Talking of identity the way to spot the difference between the V8 and V10 R8 is that the V8 has smooth blades all the way down whereas the V10 has widened air intakes so step out below the height of the door handle. On a personal note a supercar should be special and there are certain vital ingredients but one is essential. The key point is a mid-mounted engine, as in the R8, so it has the perfect balance over the axles, it then has the correct hunkered-down, cab forward stance so the driver is in the best position to see the road and control the car. Anyway back to my original point which was features vital to a supercar and one such is the visible engine which, in the case of the R8, is a glass cover. To increase its swagger the engine bay is illuminated so at night both pedestrians and other motorists by can see where your money has gone. As I had the car for a week I hand washed it which is a good way to see and feel the shape of the body. One thing was obvious is that the shape is sleek and the fixings flush with the undercarriage aero noticably present although not shouty. It has been designed and built to travel at seriously high speeds but also be quiet and stable. Open the door to the cabin and it has a set of nicely damped notches to open to varying degrees so you don't knock on the neighbouring car. Step in across the wide but low sill and, as you step sideways rather than down, access and ingress can be achieved gracefully. If you have driven a modern Audi then you will feel instantly at home in it, only this time trimmed with the finest quality leather draped over all of the surfaces. Seen in the test car with contrasting stitching (a £275 option) it really is a lesson in restraint and class. The cab forward design and wide body offer generous interior space with plenty of foot, head and elbow room whilst the reclined driving position with long reach steering wheel has very much the feel of a race car. The seats, whilst not looking particularly sporty, offer a good blend of long distance comfort with sufficient lateral support. On the tech front the R8 is starting to feel its age and is positively shown up by the new TT's gadget laden cabin. The sat nav doesn't take full postcodes and cruise control isn't standard but the standard fit hifi has a great sound although the CD changer is optional! On the road is where the R8 excels and that old hat tech is easily forgotten. On start up the V8 makes a great sound particularly from cold when the exhaust flaps are open, much to the dismay of your neighbours. Acceleration is rapid as it should be in a supercar with 0-62mph coming up in 4.3 seconds before going onto a top speed of 187mph. The V8's 0-62 time is 0.7 of a second slower than the equivalent V10 R8 and oddly enough is the more enjoyable car to drive for being that tiny bit slower. On a recent driving day at the Millbrook Alpine circuit I drove a Golf R and McLaren 650S back to back. Now the McLaren was the biggest emotional high but I had more fun in the Golf as I was able to use all the power and for longer, extracting every last rpm and bhp out of the 2 litre engine. In the 650S full power could only be used a few times and even then you have to be wary in case it overwhelmed the rear tyres. The same principle occurs when you drive a model with slightly lower performance and the V8 R8 is still incredibly quick but you can use full throttle for longer than the V10 which is a more enjoyable experience and also better news for your licence. Manufacturers constantly strive for more power for next gen models whereas the key is lighter weight and more accessible performance. One thing the V8 doesn't lack is noise and with such high revs available it constantly rumbles and bellows just behind the cabin. Being naturally aspirated it does need 5-6,000 revs to feel properly quick but select sport mode and leave the S Tronic box to pick the cogs and keep the revs in the upper reaches and acceleration is properly in keeping with the £100,000 price tag. Being in sport mode also adds in throttle blips on down-changes and permanently opens the exhaust flaps so the V8 can be heard singing its heart out just inches from your head. On the go the S Tronic can swop cogs incredibly quick as the next gear is lined up using the second clutch so changes are completed like flicking a switch but at pedestrian speeds there is a small amount of lurching as the clutch is unsure how much to slip. Despite the car running fixed rate dampers the ride is actually very good, it can be fidgety at low speeds on roughly surfaced roads but potholes don't shake through the cabin. Where it excels, as perhaps it should do, is in the corners as the wheel control and balance have been perfectly honed to this habitat and even when you provoke it mid-bend it doesn't snap back as that 30% power sent to the front wheels is just enough to keep things in check. The cab forward design and small weight over the front end means oversteer is almost non-existent but be hamfisted with the throttle and oversteer can be easily provoked which can be effortlessly balanced on the throttle, just a small let off and it steps back in line. This safe and playful set up has been the R8's forte since launch and remains as good today as it ever was. As a GT car the R8 is the perfect companion. On the motorway it is beautifully serene and stable due to being designed for high speeds, the cabin is spacious and the seats are comfortable. After a 190 mile journey I exited the car feeling fresh as a daisy. The brakes work really well, there is a hard feeling initially to the pedal action but keep going and those large calipers begin to clamp the pads to the disks and then the modulation starts to shine through so the car can be nicely placed on the road. The lack of servo takes a little getting used to but after a while is rewarding. Even 7 years after it was launched the R8 is competitive in the market and still giving Porsche a headache, and proving Audi got the design and engineering spot on first time. As a road car the V8 engined R8 is the most fun as that brilliant engine can be fully utilised and heard for more of the time. In addition the small weight saving helps it reacts quicker to direction changes and makes it that little nimbler on its feet. 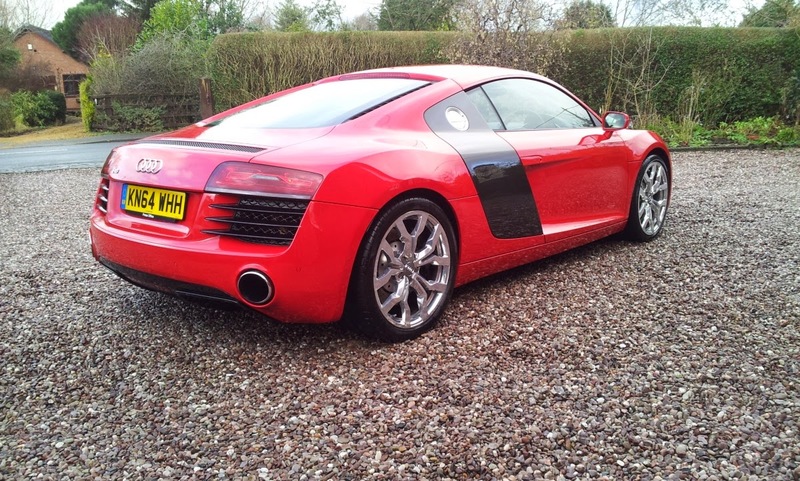 As a car the R8 is simply outstanding and even when it is fitted with the mere V8 it is a bona fide supercar! I can't wait for the second generation model.